Although “staging” homes is a business that has been around for a long time, it was not until the 1990’s that it grew into what it is today. Preparing a home to be seen by perspective buyers is a very important step if one is serious about selling their home quickly and for a good price. As simple as it may sound, making a home attractive to different types of buyers is not as easy as it may sound. Staging a home properly is truly more of an art form and less of a science. Although it is probably best to hire a professional to make your home as appealing as possible, not everyone chooses to do so when they have placed their home on the market. 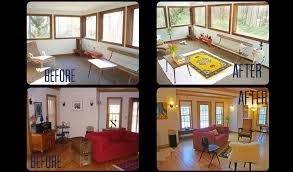 It’s important to remember that an empty home without furnishings will not be as appealing to buyers as one that contains the proper furniture and decorative items. If you are in the process of selling your home and have made the decision to do your own staging, here are some key points to keep in mind. Remember, the better that your home looks, the quicker it will sell! Everyone likes a well lit home. Make certain that each room of your home makes the most of the available natural light. Replace dark curtains with lighter shades if necessary and install additional lighting fixtures if needed. Do whatever it takes to provide a bright and cheery atmosphere in every room. No one wants to buy a dungeon! Staging begins before anyone walks in the door. You’ve probably seen more than one home that is beautiful on the inside but not so great on the outside. This is a HUGE mistake if you are trying to sell your home. No matter how nice the inside of your home may be, it’s a sure bet that most people won’t even bother to come in if the curb appeal is zero. Take the time to cut the grass, paint the porch, whatever you need to do to make your home as appealing as possible. It won’t do you a bit of good to have a thousand visitors a day if no one bothers to ring the doorbell! Clutter and misplaced furniture are a sure way to send interested parties running! As silly as this might sound, I can’t count the number of homes for sale that I have seen in complete disarray. As a realtor it is very frustrating for me when the home seller makes less effort than I do to secure a buyer. More importantly, the odds of someone selling their home are almost nil if people viewing the home need to step around a couch to get to the kitchen or negotiate a stack of boxes to make it to the stairs. People have different tastes and personal items may avert the attention of an otherwise interested buyer. It’s completely understandable that you simply love that old black and white photo of 1940’s San Francisco above the fireplace, but not everyone will agree. When it comes to artwork and other personal items on display the harsh reality is that prospective buyers simply don’t care. The idea is to help them imagine what it will be like if they live in the home and it’s very important to make the home feel as “neutral” as possible. Take the time to put all of your high school baseball trophies out of sight; you’ll be glad you did!